← Buds monitors his belly! Santa came to visit us today because we’re just extra special. Some of the women had their kids here to meet Santa, and they were so excited, running down the hall to see him. It was both adorable and slightly heartbreaking, for all of us stuck inside the hospital for Christmas. Buds is with Grandma and Papa today, so not able to see Santa, although I know that he would have looked him over as if deciding whether or not he stacked up. The nurses and staff decorated our wing, and little ornaments hang from the ceiling. Jas bats at them like a cat whenever he visits. 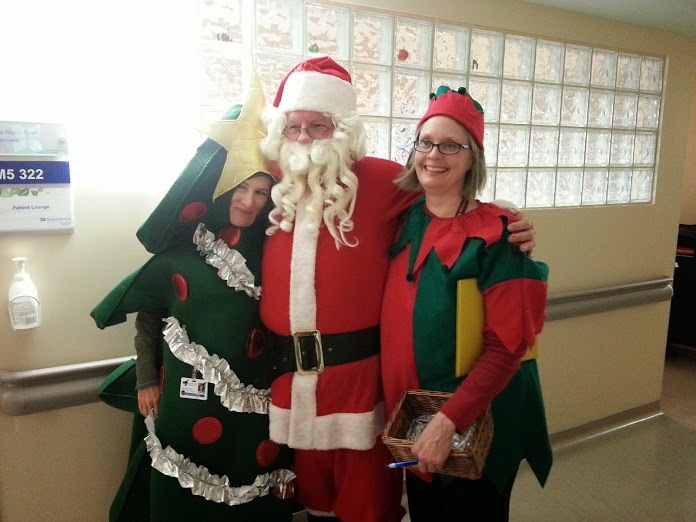 A little Christmas cheer is spreading through the halls here at High Risk Obstetrics, and there’s absolutely nothing wrong with that. This entry was posted in Hospital life and tagged Christmas, holidays, hospital, Santa. Bookmark the permalink.